This is a sketch that I've made that shows up imports between classes in model. I hope I haven't missed anything. View is very similar. In model there is also modelWriter but it uses a lot of classes and is not used by anthing, so it makes up only unimportant mess. The sketch does not consider utilities but utilities repo is not depended on engine, so there can't be any hidden dependencies there. still too many imports. 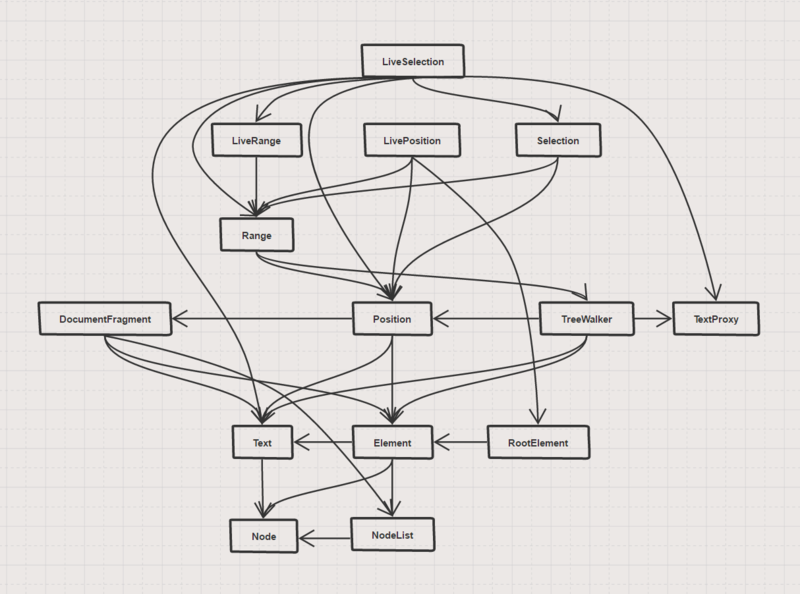 The graph ended up much more complicated than I thought, but it's better than it could/was. A lot of those imports are just for instanceof purposes, and the rest is mostly for extending. DocumentFragment needs Element and Text only for it's fromJSON method, in same manner Element needs Text. LiveSelection uses a lot of stuff too, maybe it can be optimized. lines go only down or sideways (in fact each time a line go sideways it could be another top-down layer but first it would make the sketch very tall, and second, this way classes are organized in a bit more logical way). This means no circular dependencies if there are no circular dependencies in one layer. I am glad that I was able to "cut out" TextProxy of Text, Element, Node section -- right now it is more of a utility class for TreeWalker. For now we got rid off circular deps in model tree structure and it's API. The question is whether I should work more to make this graph even more clear or is it okay right now? TBH it will be hard to make it any better and I fear that many solutions would just come down to hide the dependencies in new classes/tools. Of course this only shows import, which is just half of truth. 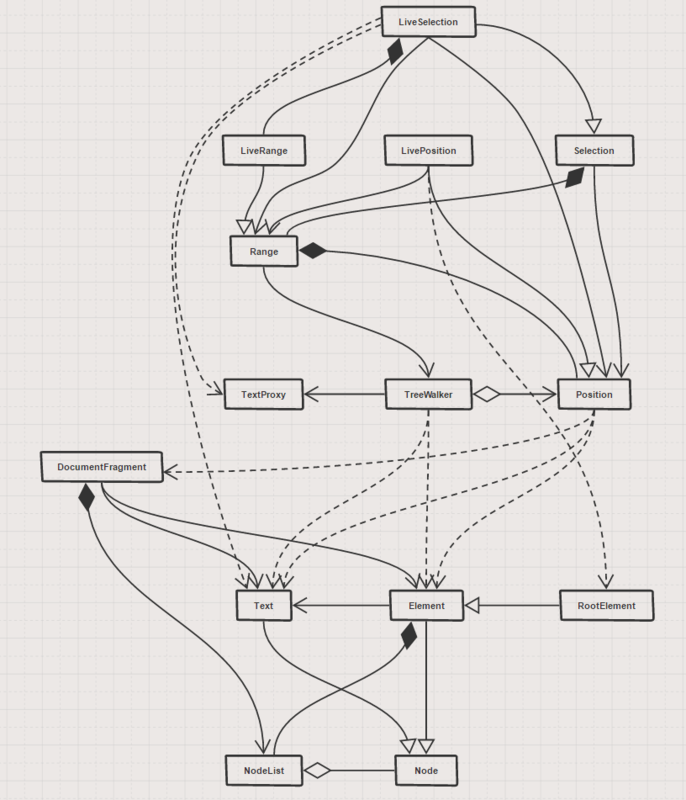 There are other dependencies, i.e. 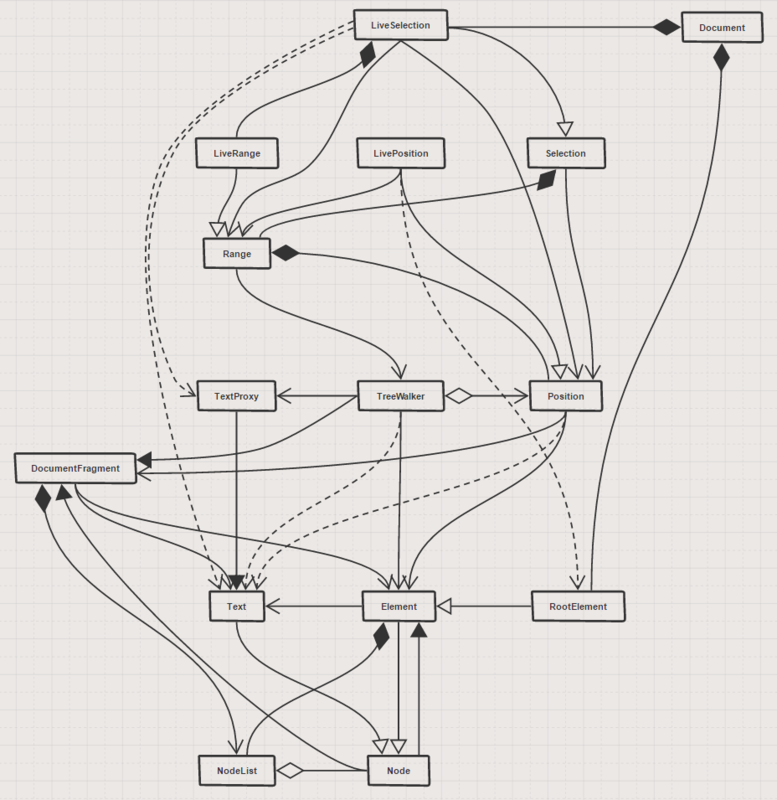 TextProxy#textNode property is Text instance, but this is different type of graph. If I had to draw this one it would be a lot more complicated, I fear. I've added relations if a class A is a property in class B but is not created by it and does not compose class B. It mostly shows "parent-children" association. It's denoted by arrow with black full point. You can see how TextProxy is associated with Text and Node is associated with Element. Those classes have references to their "parent" classes (parent in structural meaning, not inheritance meaning). I've skept those arrows if a class composes another class (i.e. RootElement has reference to Document but their association is already denoted by composition arrow). I've also changed some arrows. Now you can see when class A composes class B (i.e. Document is composed by many RootElements). Dashed arrow means that class A imports class B but does not instantiate it nor has it as a property. Those arrows means "instance of" imports. Solid arrows with full white point means inheritance. Solid arrows with not-full point means other relations. Mostly creating instances of given class but not using them as property or importing for "instance of" purposes but also having instance of given class as property. I've updated first image in post above. Also, I think, that we are fine not caring about property-dependency as long as we do not import given file (so second image is more important, IMHO).